IMPORTANT NOTICE: As of September 2018, What's In It offers over 250 reviews of young adult books! While I am excited to offer you so many reviews, I have burned myself out on this genre. Despite some wonderful gems, the genre tends to be dark and spiritually draining. Because of this, I am no longer reviewing books on a regular basis, at least for a while. Instead, I will review books on request and seek more volunteers. If you would like a book reviewed, please contact me through my "Cheri's Corner" page. If you are interested in reviewing a book, I would love to have you join me in this venture. Please visit the "How You Can Help" page. Thank you for visiting ​What's In It! Please scroll down to begin using the website. What's In It? : The Concerned Parent's Guide to Young Adult Literature is a unique resource for anyone concerned about the entertainment being marketed to our teens today. If you find it helpful or if you have suggestions for ways to improve the guide, please take a moment to send me your comments. Click for a quick search of the most recent reviews. What's In It? is in constant need of books reviews and feedback in order to make this resource as useful as possible. Please visit the "How You Can Help" page to learn more. As of June 2015, my review format has changed to an essay style. Though the new format will lack the precise detail of the old one, it will allow reviewers to accelerate the review process and thus cover more books. 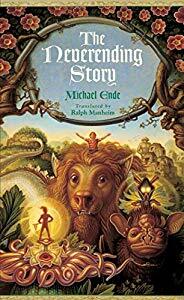 Yes, this is technically an older-child's fantasy, but it is also a complex, rich, and beautiful one that I have never forgotten--a contemporary classic that many teen readers will enjoy. Fun fact: those who remember the movie will be surprised to know that it covered only part of the book! The Denim Beret is an online program that seeks to serve the needs of teens and preteens who are ready to master the art of non-fiction writing. I offer both structured lessons and project-based mentoring for both homeschoolers and non-homeschoolers. Please browse my website for more information!